Can’t buy me love, or adventure for that matter: Expensive reminders about what makes for a great travel experience. As any Central American traveler will confirm, Costa Rica is different from the rest of it’s neighbors to the north. Called the ‘Switzerland of Central America’ it’s more than just a lack of military presence that distinguishes this country. First off, from my back of the envelope calculations, it’s at least four times more expensive than everyone else. But, this money gets visitors what they’re looking for: a quick trip full of adrenaline rushes that’s packaged, presented, shuttled and harnessed. Everyone speaks English, accepts dollars and is full of convenient and fun tours that can be enjoyed with other Americans, and maybe an occasional European or Canadian. But that’s not the only way that Costa Rica differentiates itself from the rest of Central America. It gets a perfect 10 on my scale for ease of travel in a country–called the TP test. How does a country score a perfect ten? High marks are earned by havingTP in every restroom. Though the scale is based ONLY on the presence or lack of TP, I’ve found that higher scores consistently indicate a greater likelihood of toilet seats, soap, bathroom doors, locks, and an actual commode, not merely a hole in the floor. Of course, I’ve found that this scale also has a direct correlation to other things like hot water, sanitary practices, disease eradication, literacy rates, access to healthy food, childhood mortality, gender equality, and quite honestly, could I be so bold as to assert that the entire GDP for a country could be predicted by the prevalence of TP? I understand the IMF is trying to get its hands on my metrics. You read it here first! But it’s more than just TP and adrenaline that make for a good trip. Honestly, we’ve had trouble not comparing these expensive over-processed, tightly scheduled tourist attractions with the genuine experiences we’ve had in the rest of Central America. For example, after paying $45 for a 35 minute tour of a butterfly enclosure, regarded as the most beautiful in Monteverde, we were rather unimpressed by the paltry presentation. 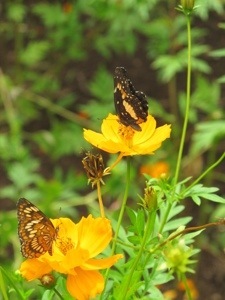 We still had visions of the butterflies at Finca Mystica in Ometepe Island, Nicaragua where the mid-day sun was thick with fluttering color that danced around a huge mango tree. We’d watch, spellbound by the display, as we relaxed in hammocks on the veranda. 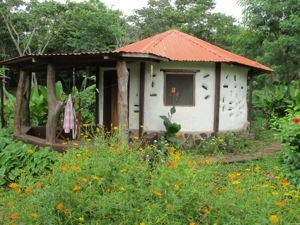 And the truth is that we paid less per night for our own sustainably built yurt-shaped cob cabin surrounded by wild flowers at Finca Mystica than we paid for a 35 minute butterfly tour in Costa Rica. 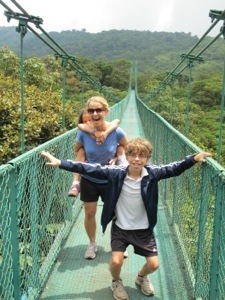 Hammocks and wildflowers aside, we were wearying of Costa Rica. 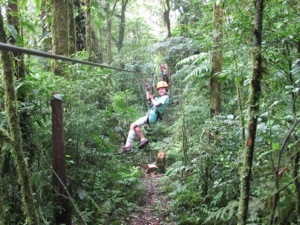 After a day of ropes and bridges and sad butterflies, we found our experience in Costa Rica less than genuine. Honestly, we were counting the days (and the dollars) until we could leave. Much of this frustration must have come from the lack of connections as it was difficult to get to know the Tico people. There was a distinct vibe that we’re just another tourist trio dropping $300 a day into their economy. No wonder this country has stellar marks on the TP Scale. Fellow tourists were not much better. As Jorge described it, while the rest of Central American travelers approach their experiences as if seated at a family style table, in Costa Rica, vacationers tend to be more insular, giving off ‘a table for two’ vibe. Frustrated, I started to realize that our dissatisfaction was more than just hurried tourists and adrenaline withdraws. Was I simply going about it all wrong? Could it be my fault? It was suddenly evident to me that I had fallen into the Costa Rican one-week-wonder tour trap. That’s not our style. No wonder we weren’t feeling pura vida! Disillusioned by the commercialism of it all, we felt desperate to dig deeper. So we re-calibrated our jaded expectations and vowed to look for the silver lining in this cloud forest. The next morning, we left our hotel and instead of jumping into a waiting tourist transport shuttle, we walked out the door with sandwiches in our back pack and headed down the road. We boarded the convenient public bus that cost $1.20. By 9:30 we had arrived down a bumpy road to a different side of Monteverde. 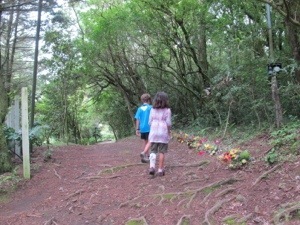 Our first stop was Bosque Eterno de los Ninos (Children’s Eternal Rainforest). I knew little about this privately held reserve and arrived without a map of course, one of the frustrating problems of traveling without my husband. We stumbled down this path and that until we came upon a man, Bob Law, who just happened to be a founding member of the reserve 27 years ago. 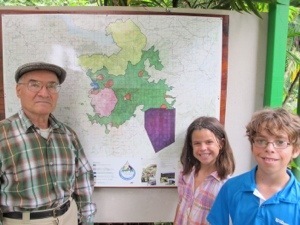 He showed us around and then started regaling us with nascent tales of the park, the idea of which came from a few of them who had initially worked with the Monteverde Cloud Forest. They formed their own organization as they had a larger vision for a reserve. Over an hour later, we had learned the history, geography and wonderful anecdotes of the park’s creation. Swedish school children in 1987, forgotten government promises, Mexican (or maybe Cuban?) defaulted loans, the last big cats, and a larger-than-life vision propelled this dream past a government’s failed promise to preserve the land. Through the organization’s efforts, the land was transformed into a private reserve that dwarfs the more commercialized Monteverde Cloud Forest. As we walked away, the kids chattered about how they really wouldn’t have cared about this park much if they had read about it in a book at school, but after meeting a founder and hearing his stories, they would always remember this first person encounter with history. Next stop? 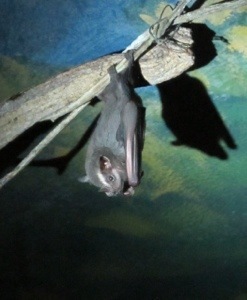 Bat Jungle (which we called ‘Bat Cave’ all day, accompanied with the appropriate Batman tune). Though bats may be some of the most maligned and misunderstood creatures on the planet, we all left feeling rather endeared to these little critters. Kelly Laval, whose father, Dr. Richard K. Laval is a world renowned bat biologist, started the bat jungle. Kelly now gives tours and enthusiastically conveys a love and appreciation for bats. Not only is she a wealth of information about bats and the irreplaceable role they play in the environment, but she knows each of the over 75 bats in their enclosure and can tell you about their family connections and endearing details of their personality. We ended the day at the Cheese Factory Tour, where we learned about the history of the Quakers that left America for Costa Rica in the 1950’s as pacifists wishing to avoid participating in the Korean war. Costa Rica was a perfect fit as it had abolished it’s military. Two of the original settlers were still alive and our guide knew them and painted a colorful picture of these individuals. They were dairy farmers who settled the area and then developed a cheese industry. The historical overview was great; thankfully we didn’t go for the cheese which was certainly not a gastronomically elevating experience. Ironically, we took the tour with a French family who were a lesson in tact and diplomacy. And in the gift shop at the end, I was quietly entertained as their kids begged them to buy the orange queso con salsa dip that came in a squeeze tube. Later that afternoon, we found ourselves skipping the bus and instead enjoying the hilly three kilometer walk back into town, talking about our day and the unexpected surprises. Though we didn’t careen through the tree tops, take death-defying swings off platforms, or spend hundreds of dollars, we found this day of relationships much more rewarding. And so, with a perspective shift, a slower pace, and for a third of the cost we were able to appreciate another side of Costa Rica. Is there a time for thrilling zip lines? 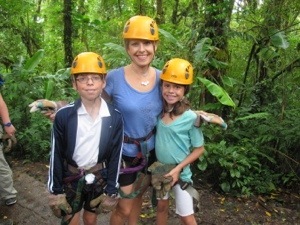 Of course, and I’m glad we didn’t leave Costa Rica without cruising through the canopy. But thankfully I realized my expensive error in trying to buy our way into an overly touristed country and then expecting a fulfilling experience. As I’d learned over the past 8 weeks, we stumble upon our own adventures easily enough. I also realized that I unfairly judged Costa Rica. After all, how unjust would I find an impression of America formed from a four day visit to the parks in Orlando? Thankfully we caught our flawed approach before it was too late. We were gifted with a rare glimpse into Costa Rica’s intrinsic value by those who love it most–through the eyes of Bob, and Kelly, and an unassuming cheese factory tour guide. And though the kids may brag about the length of the zip lines to their friends, it’s the message from these three that will be more likely to find a way into their psyche and shape their choices, impact their world view and influence their motivations as they grow. And though I can always carry a stash of TP in my bag or pay the old lady for a wad of it at the bathroom entrance, I’m reminded that genuine encounters can never be bought or engineered. They simply happen to an unsuspecting traveler who is willing to wander slowly down the road. This blog is dedicated to Kelly Laval and Bob Law who both spontaneously took a few hours from their day to share their passions with three bleary-eyed travelers. May I find myself as generous to those who wander down the path in my life. Truly enjoy all your travel experiences. Your children are so amazing and they will carry these adventures with them all their lives and share them some day with their children. BTW, you are an excellent writer! Renate–so glad you enjoy our adventures. It’s been so much fun to take this trip with you traveling along with us vicariously. Love all your advice and connections. I totally get what you are saying about Costa Rica. When we visited we stayed in a bed and breakfast that used to be a brothel, as we later learned. We were assured that all the mattresses and bedding was new. 🙂 there were huge ants coming in but we could hear and see howler monkeys outside our windows. It was so much more rewarding to stay there and chat with the owners than the luxury of the surf and yoga town. 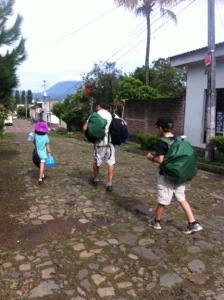 The were definitely a Tico town and a gringo town: the separation was disheartening. I’m so sad you’ll be coming home soon. I’ll miss your adventures. Victoria–what a story and experience you had in Costa Rica. Glad you relate. Can’t believe that the trip is coming to an end. Will have to talk about next summer–we’re thinking of Peru and would love tips. How is it that I enjoy each posting more than I enjoyed the previous one? I think it is really that each one is so fresh and personal, so insightful and enlightening. The secret of the sojourner is indeed immersion, not skimming the shining surfaces. Water is only water when you are submerged. Our humanity is only truly realized when we sink into it. Blessings on your travels and thanks for daring to be REAL.